- Low noise gain controlled amplifier up to 1 GHz. Total Power Dissipation: 200mW max. Forward Transfer Admittance: 24mS typ. Input Capacitance @ Gate 1: 2.1pF typ.. Reverse Transfer Capacitance (f = 1MHz): 25pF typ. Noise Figure (f = 800MHz): 1.0dB typ. Operating Junction Temperature: 150°C max. Gate 1-Source Breakdown Voltage (VG2-S = VDS = 0; IG1-SS = ±10 mA): 6.0V min. ; 20.0V max. Gate 2-Source Breakdown Voltage (VG1-S = VDS = 0; IG2-SS = ±10 mA): 6.0V min. ; 20.0V max. 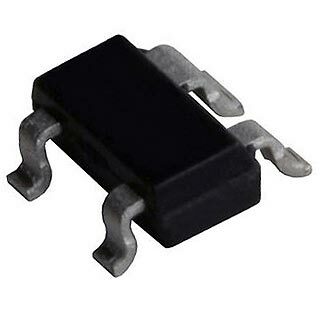 Gate 1-Source Cut-Off Voltage (VG2-S = 4.0V; VDS = 8.0V; ID = 20uA): 2.0V max. Gate 2-Source Cut-Off Voltage (VG1-S = 0; VDS = 8.0V; ID = 20uA): 1.5V max. Gate 1 Cut-Off Current (VG2-S = VDS = 0; VG1-S = ±5 V): 50nA max. Gate 2 Cut-Off Current (VG1-S = VDS = 0; VG2-S = ±5 V): 50nA max.